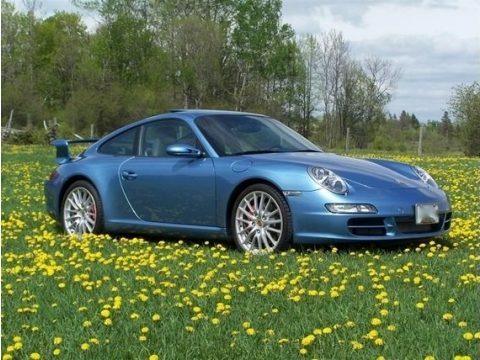 2006 Porsche 911 Carrera S Club Coupe For Sale in Barrie, Ontario Canada Get ready to feed your need for speed with this 2006 Porsche 911 Carrera S Club Coupe! This high performance sports car features a sleek, aerodynamic design that is laced with all of the intelligent design engineering for which the Porsche nameplate is known. However, this striking 911 is much more than meets the eye. It is number 39 out of 50 total units produced in recognition of the 50th Anniversary of the Porsche Club of America. It is dressed in the exclusive and distinctive color of Azzuro Blue paint that is complemented by a unique interior styling that features factory, two-tone interior in the shades of Stone Grey and Black. Powered by a 3.8 liter engine that is equipped with six horizontally opposed cylinders and mated to 6-speed manual transmission, this handsome devil is eager to inspire your passion towards rare Porsches. With only 3,044 original miles you can rest assured that this vehicle will provide a dynamic display of power, performance, and dashing good looks for many years to come! Additionally, it comes fully loaded with amazing options and features, such as: Azzuro CaliforniaBlack / Stone Gray Two-Tone InteriorCanadian EmissionPersonalized Door Entry GuardsPorsche Crest in Headrest Seat Belts - SilverSelf Dimming Mirrors Wheel Caps with Colored CrestBOSE High End Sound PackageCarrera Power KitSport Chrono Package PlusSport Shifter19" Sport Design WheelInstrument Dials in Black Seat Backs Painted Exterior Color3 Spoke Steering Wheel - Interior LeatherSport Series Seats with Full Leather Factory Aero Kit PackageBi-Xenon Lighting System Carbon Filtered Ventilation System Central Locking System Cross Flow Cylinder CoolingCustom TailoringActive Brake Differential (ABD)Anti-Theft System with Radar Interior SurveillanceAnti Lock Brakes (ABS)Automatic Full Climate Control with A/C Double Inertia Flywheel Dual Front Airbags Dual Knock SensorsDual Vanity Mirrors - IlluminatedElectric Sliding Roof with Tilt Front and Rear Stabilizer BarsHydraulic Clutch Integrated Dry Sump Lubrication Integrated Third Brake LightIntermittent Wipers with Rain SensorsLockable Storage CompartmentPCM Color Display Radio with in-dash CD Personalized Door EntryImpact Protection System (POSIP)Porsche Stability Management (PSM)Power Heated Side MirrorsPower Windows with One TouchCruise Control Stone Grey Floor MatsTraction Control (ASR)Variable Ratio Power SteeringVented and Perforated Brake Discs And More! This car has been stored in a climate controlled glass box that was specifically made in the garage for the car, hidden from sunlight and any elements, stored under its cover and on tire cradles to prevent the original tires uneven tire wear from storage. While in storage, the car has a constant battery charge on the original battery. This car has never seen rain, let alone a cloudy day. This car has every service record and document since it was ordered in 2005. It is meticulously clean. The first production model of this vehicle was returned to the Porsche Museum in Germany and one lucky PCA member won the 15th model in a sweepstakes drawing. The remaining 48 models were offered to randomly chosen PCA members who applied to purchase this extremely rare car. The Porsche 911 Club Coupe, which was available only in the unique Azzuro California colour, comes equipped with a more powerful 381hp engine with the X51 Power Kit. Other features unique to this special model include a vehicle identification number (VIN) which ends with the production number and special commemorative badges and door sills which adorn the interior. Additional exclusive options were available to customers and this one has the Aero kit Other exclusive options include Storage Compartment Lid with Model Logo and the Porsche Crest in the Headrests. The 911 Club Coupe's most visual exterior feature is its distinguishing Azzuro California Blue color. This paint color is a modern interoperation of azure blue, a color mode popular on Porsche 356 sports cars when the PCA was founded 50 years ago. The rear portion of the standard center console and the rear of the drivers and passenger seats is also painted in Azurro California. In addition to the sport series seats, the 911 Club Coupe's standard interior features include black instrument dials and a sort steer in wheel and gear shifter. Stainless steel door sills incorporate the 911 Club Coupe logo, and each car bears a badge on the drivers side door trim indicating its individual number in the series of 50 cars. The interior also features the Sport Chrono Package Plus which enhances vehicle performance through a system that simultaneously alters elements of chassis, engine, and transmission. In addition to the ability to take performance to new heights, the Sport Chrono Package equips the vehicle with performance display, digital and analog stopwatches, and the Sport Plus button. The Club Coupe was the first in the current generation of Porsche 911 Sports cars to be equipped with the X51 Powerkit. This feature increases the output of the 3.8L, flat six cylinder Carrera S engine from 355hp to 381hp and peak torque from 295 to 306 ft. lbs., making it, at the time, the most powerful non-turbocharged engine offered in a Porsche 911 production car in North America. Distinguished by its carbon finer air cleaner housing, the X51 Powerkit boots performance through a series of engine enhancements including a larger throttle body, optimized intake airflow, cylinder heads and exhaust manifold modifications, changes in the control unit, and the inclusion of a sport exhaust system. The result produces a 0-60 mph time of 4.4 seconds, and a top track speed of 186mph. This 2006 Porsche 911 Carrera S Club Coupe is a must see to truly appreciate everything it has to offer in the way prestige. In fact, come see for yourself! You will agree that you cannot find another Porsche as rare, and as well cared for, as this one. If you are someone who appreciates the finer things in life than you owe it to yourself to check out this S Club Coupe. This is a once in a lifetime opportunity so don't delay - Call today for more information on how the ultimate Porsche ownership experience can be yours with this unparalleled 911 Carrera S!! !